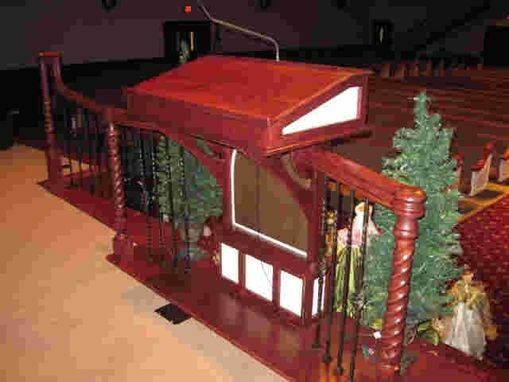 Pulpit for Fellowship Baptist Church in Vienna, WV, as part of a new church sanctuary build in 2009 included 36 feet of altar rail as well. Pulpit and rail include both painted and stained oak elements with the arches made by cold-bent lamination. Each three-arch section (total of six sections) had to be connected to the adjacent section with concealed connectors so that it appeared as one section of the arc on either side of the steps leading to the platform. 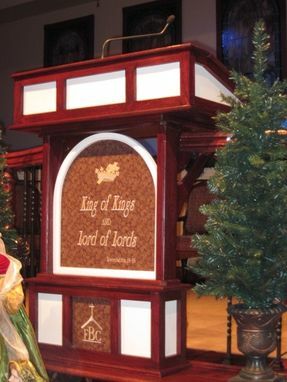 Pulpit features a hinged lid for storage and hinge cover to hide shine of piano hinge to prevent interference with video taping used during services. 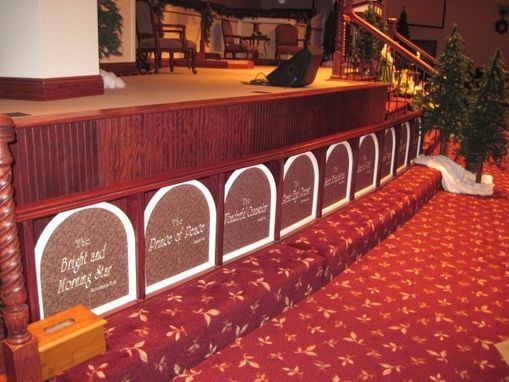 Pulpit is anchored to the floor in a manner that makes it easily removable. Added storage for microphones, etc. provided in base. 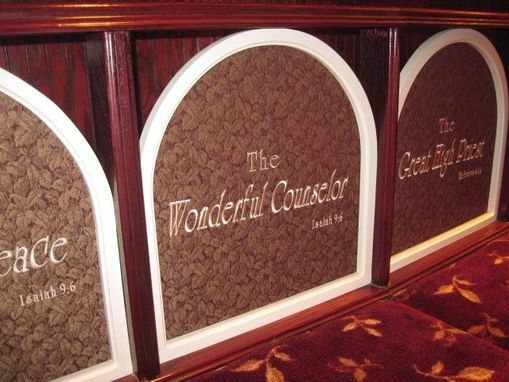 Each arch in rail contains an embroidered panel featuring 18 different names given to God or Christ in the Bible. Embroidery provided by our sister company Knot Just Stitches (unfortunately, that business closed in 2009 because of illness). Dimensions: Each section measured approximately 6 feet. When connected, the railings covered 36 feet in two sections on either side of stairs. Pulpit top surface approx. 30" x 25".